Lollie the lurcher was a much loved family dog who, sadly, came to us due to a marriage break up. Happily, we were able to rehome her immediately to another family situation and here are some photos of her in her new home. 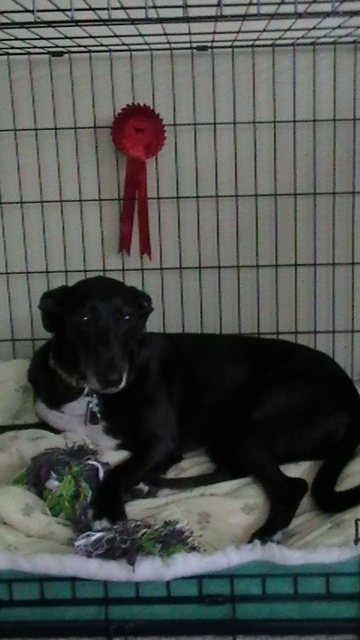 Here's what Lollie's new Mum has to say about her: We entered Lollie in the Axbridge Dog Show run by Labrador Rescue today, and she came first in the obedience class!! Her first rosette with us! It adorns her "bedroom" as I write. Lollie is still a very obedient, happy and much loved member of the family, and tolerates the children so well. She was so protective of them on holiday, looking out for them when they were in the sea and on fun rides. It's as though she has always been here, we love her so much.